Storage magazine has been surveying its storage administrator audience members twice a year for a decade to get a reading on their storage hardware and software purchasing plans. We analyze the survey results to spot data storage trends that impact your customers' purchasing plans. This information can help you be smarter about what storage products you provide to customers and how you go about selling them. In this first of five reports on the fall 2012 storage Purchasing Intentions results, we examine survey respondents' IT budgeting plans to see how storage budgets compare with those of previous years, how big they are, how the budgets are allocated, how much disk capacity they're planning to buy, and which technologies they're most likely to implement or evaluate. 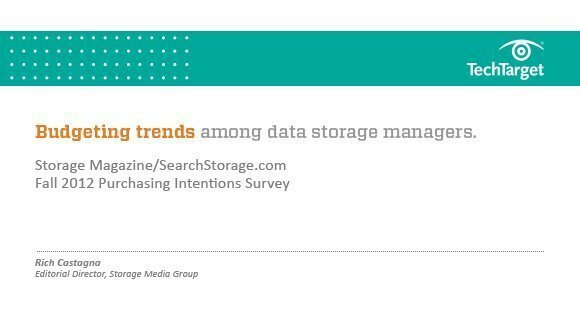 This survey was directed and analyzed by Rich Castagna, editorial director of Storage magazine and TechTarget's Storage Media Group of websites. The survey was conducted in September 2012, and respondents were screened for specific storage purchasing authority. There were 702 qualified respondents from among all vertical industries, reporting an average annual revenue of $1.3 billion and an average 1.7 petabytes of data under management on all types of media.